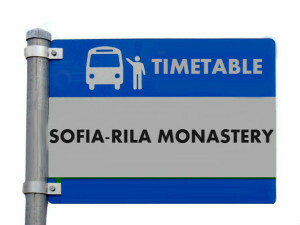 Rila Express Ltd is a company offering regular public transport straight from Sofia to Rila Monastery and back again, 7 days a week and a tourist transport on request. The company also owns shuttles running hourly between Blagoevgrad and Rila town. Our mission is to make sure you have received a comfortable and secure travel! For your comfort we have air-conditioned coaches equipped with folding backrests seats and seat belts, DVD and audio system. For your safety we have qualified professional drivers and travel insurance to make your trip a pleasant one. Rila town, 1 St. St. Kiril and Metodi str.